Smoke Gets in Your Ears: A Mad Men Podcast episode 14 is available for listening or download right here, and on iTunes here. Where were you when JFK was shot? The characters on Mad Men find their everyday lives, their ad campaigns, and their affairs interrupted by those bullets in Dallas. 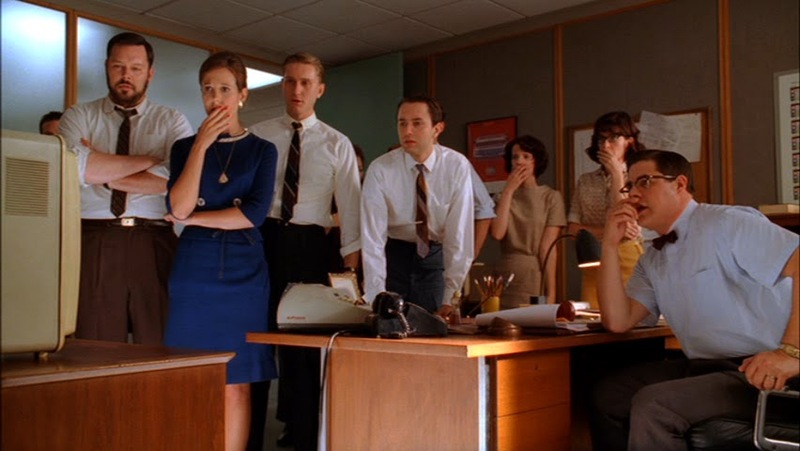 AJ, Kenn, and Joe, who weren’t around on 11/22/63, sift through Sterling Cooper’s sense of loss and share reactions to their generation’s closest reference point: 9/11. The episodes under the lens this week are “The Color Blue,” wherein Betty consults an attorney; “The Gypsy and the Hobo,” in which Ms. Farrell spends a lot of time in the car; and “The Grown-Ups,” wherein Lee Harvey Oswald ruins Margaret’s wedding. Plus, don’t miss another exciting installment of Hamm Watch! This entry was posted in Smoke Gets in Your Ears and tagged 1960s, 9/11, aaron staton, abigail spencer, amc, drama, elizabeth rice, itunes, january jones, jfk, jfk assassination, john f kennedy, john f kennedy assassination, jon hamm, kennedy assassination, lee harvey oswald, libsyn, mad men, matthew weiner, michael gladis, podcast, rich sommer, september 11, smoke gets in your ears, television, tv, vincent kartheiser. Bookmark the permalink.